We have divided the 36 Gracie Combatives techniques into 23 one-hour classes so that you can complete the course at your own pace. We strategically designed the lessons so that you need no experience to participate in any one of them. As a result, you can complete them in any order, and as many times as you wish. Upon enrolling, we will issue you a Gracie Combatives Card on which we will track your progress through the 36 techniques. Each month, you will receive a Gracie Combatives Calendar identifying which techniques we will teach on each day of the month. Once you complete each of the 23 Gracie Combatives lessons two times, you will qualify to participate in the Reflex Development Classes. In these lessons we use a revolutionary training process called Dynamic Reflex Development™ to build your reflexes in the execution of all 36 techniques in every possible combination and at various levels of intensity. Once you complete all of the Gracie Combatives lessons three times, and develop your reflexes in the execution of all 36 techniques individually and in every possible combination, you will qualify to take the blue belt qualification test. The Gracie Combatives program is taught exclusively at Certified Gracie Jiu-Jitsu Training Centers around the world and now is available to you in the only Gracie Academy certified training center in Northern Virginia: The Basics Gracie Jiu-Jitsu of Leesburg. Children’s inability to stand up to a bully is rooted in profound fear for their personal safety. The victims know that they must confront the bully and would like nothing more than to stand up to them. But, they simply can’t follow through for fear of the physical harm that backs the bully’s every action. And, therein lies the challenge – how do you instill in a victim of bullying the confidence to face the tormentor, look them in the eye, and back them down? The answer is simple – teach the victims to defend themselves against physical attack, and the rest will follow. Most martial arts programs rely on striking the attacker with violent punches, kicks, knees, and elbows. In the Gracie Bullyproof program, we take a different approach. All the techniques are purely defensive and utilize no strikes. Furthermore, we teach children how defuse confrontations with words and never to initiate physical aggression. If attacked, we offer techniques to non-violently neutralize the threat and gain control until help arrives. In the Gracie Bullyproof program, we teach the children how to fight fire with water. 1. Instill Confidence: Bullies are less likely to target self-confident children. We instill confidence by teaching techniques that will neutralize the attack of a larger opponent. 3. Ensure Readiness: Only when your child makes it clear that he/she will not tolerate the harassment, will they free themselves of the bully’s torment. We will prepare them for every common contingency. 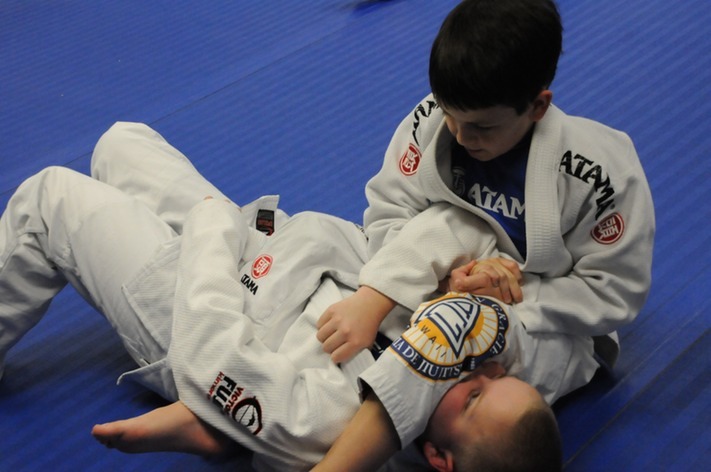 Aside from preparing your child to deal with bullies, the other objective of the Gracie Bullyproof program is to instill in your child the character traits that will lead to success in all areas of life. There are six chapters in the Character Development Program: Responsibility, Health, Respect, Citizenship, Manners, and Caring – each of which your child will study for two months. We dedicate time in each class to address the featured trait and the simple things they can do to make the trait a part of their everyday lives. The secret to the success of this program is a very powerful point-based reward system that encourages each child to make the small character changes in their daily lives – on their own! Little Champs: from 5 to 7 years old. Jr Grapplers: from 8 to 14 years old. Black Belt Club: for the most dedicated kids (invitation only). At this age, children are not interested in learning martial arts, but they sure don’t mind “playing” martial arts. The Little Champs secret is that we have devised a series of 10 “Gracie Games” in which we secretly teach the children essential self-defense techniques. By playing the fun and challenging “Gracie Games,” children develop strong reflexes in the execution of the basic techniques, as they unconsciously learn the foundational principles of leverage and control. Once a child masters the Gracie Games, or turns 8 years old, we promote them to the Jr. Grapplers class. Since bullying is most prevalent in this age group, we teach the children in the Jr. Grapplers classes the 33 techniques they must know in order to defend themselves if physically attacked by a bully. The best part about the techniques is that they are totally non-violent, and are only applied in response to the physical aggression of a bully, ensuring that the techniques are never used for the wrong reason. Unlike most martial arts, which are unnecessarily violent, we do not use any punches or kicks. Instead, we teach the children to use leverage to establish control over the bully until help arrives. Once a child learns these techniques, they no longer have to live in fear, and the increased confidence this gives them is the single most effective deterrent to bullies. Jr. Grappler students who master the 33 techniques and display a very high level of focus will qualify to move on to the Black Belt Club. Simply put, we teach the children in the Black Belt Club like adults. We present the techniques at a level of detail that far exceeds that of the Jr. Grapplers class. The final objective at this level is to prepare the children for a smooth transition into the adult Gracie Jiu-Jitsu programs, and to instill in them the character traits and discipline necessary to make it to black belt. After a successfully completion of the Gracie Combatives program the student will be exposed to even more details that will help them deepen their understanding of the techniques. They will also learn different variations of previously learned techniques but even more, totally new techniques will be presented at this level. Although the focus on self defense is always our main concern, in this class the student will be taught some sport Jiu-Jitsu techniques as well. The sport Jiu-Jitsu techniques are not only fun to practice but they also help to develop basics attributes like intuition, balance, sense of leverage, reflexes, awareness and others. The Basics Gracie Jiu-Jitsu is the only certified school in Northern Virginia to teach the Women Empowered course, which is the official Gracie self-defense program for women. In this 10-lesson program, we will teach you how to neutralize the 15 most common attacks ranging from having your hair grabbed to being pinned to the ground by a weapon-bearing assailant. Each one-hour Women Empowered lesson addresses two techniques. You can start the program at any time and participate in any class without previous experience. Unlike most self-defense systems that rely heavily on strength, speed, and coordination, the techniques in the Women Empowered program employ leverage, technique, and timing, so anyone, regardless of age or athletic ability, can make them work against larger opponents. Once you complete the Women Empowered program, you may test for promotion to Pink Belt! Upon enrolling in the Women Empowered program at The Basics Gracie Jiu-Jitsu, you will receive a free subscription to GracieUniversity.com. Through this interactive website, you will have access to detailed video instruction on every technique in the course, enabling you to study the lessons on any computer or mobile device 24 hours a day! Furthermore, all active students at The Basics Gracie Jiu-Jitsu qualify to train at any other Gracie Certified Training Center around the world. Since the curriculum is the same at all Certified Training Centers, you will receive credit for every lesson on your Women Empowered attendance card when you return home!. To ensure the Women Empowered program is for you, we invite you to take advantage of our 2 weeks free trial. To take advantage of our 2 weeks free trial, sign up for a trial or contact us at The Basics Gracie Jiu-Jitsu and a student services representative will help you get started right away!